In this experiment I am aiming to investigate how different bulbs emit different light intensities depending on the potential difference applied to them. I will create my own sensor using a potential divider circuit using a Light Dependent Resistor (LDR) along with a lux-meter to calibrate it and then collect readings. What is a Potential Divider Circuit? y regardless of whether the ambient lights were on or off. This meant that there would be no need to tape the box to the workbench. This improved method incorporates the new Xlogger lux meter which is integrated in the top of the cardboard box, right next to the LDR. This means that they will be both recording the same light intensity th us resulting in the most accurate calibration possible. The gaps in the cardboard box have been sealed and the bulb stand is also secured to the desk to prevent movement and a bias towards either sensor. To ensure a fair test, the same VARIAC was used for all experiments as actual figure of voltage through the light bulb may depend on the accuracy of the VARIAC. Of course this is not a problem so long as the same apparatus is used each time. 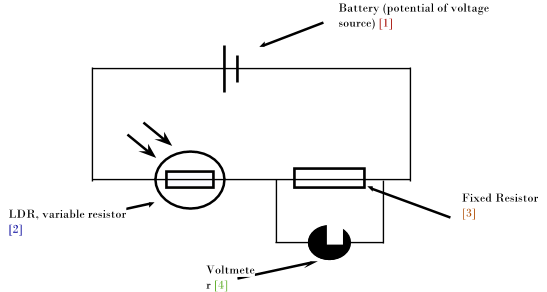 As explained at the beginning a potential divider circuit works by using a variable resistor (the centre of the sensor) in conjunction with a fixed resistor along with a power supply. By measuring the potential difference across the fixed resistor, the LDR, a sensor reading can be recorded. The LDR achieves this by being a semi-conductor, that is to say that it is a material with a conduction rating between that of a conductor an an insulator. The atoms inside the LDR have bound electrons. These electrons require different amount of energy to escape from the atom and pass a current through the semiconductor. Light, which is made up of packets of photons, determines how many of these electrons are free to flow and pass a current. 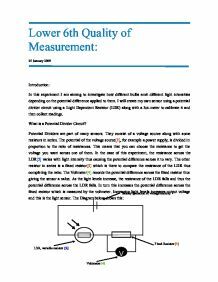 Therefore the higher the light intensity, the lower the resistance of the LDR and thus the lower the potential difference across the LDR. 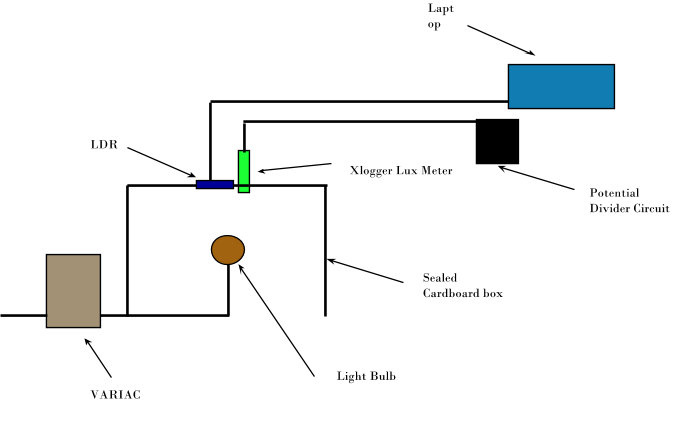 The method can be used to measure only a certain range of light intensities for which a) the LDR is calibrated for and b) the range that the LDR can accurately interpret. 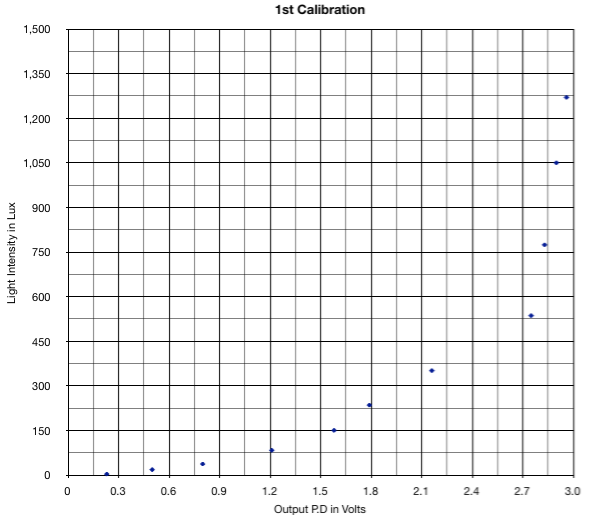 This is due to the nature of the calibration curve: there is only a specific range range of input potential differences for which the LDR can operate when used with a specific fixed resistor. 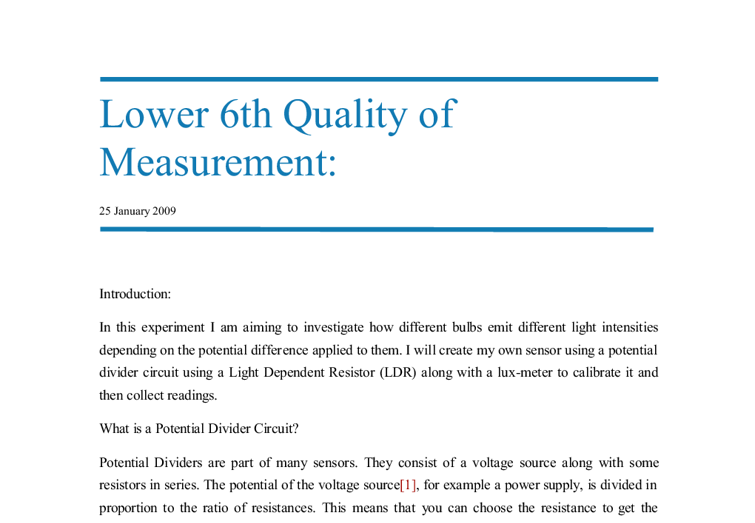 This is why the experiment only measured light intensity between 80 and 140 volts because outside of that spectrum, the ratio between the 250Ω fixed resistor and the LDR is too small or too great to give an accurate reading. When presented on a graph it is at the extremities: when the gradient is close to 0 and where the gradient is close to 1.
experiment will be the value for the area of the cross-section of the wire. This is derived from the diameter of the wire, which has a very small value (to the order of x10-4m), so it will have a large percentage error, even though the micrometer is accurate to �1x10-5m. So the resistance of the LDR increase four times. Fair test: But there are some variables, which can also affect the brightness of the light bulb: 1. As the reasons show above, the brightness of the light bulb plays the main role in affecting the resistance of the LDR. 2. The distance between the light bulb and the LDR. The atom remains as a positively charge ion. Since there are equal numbers of free electrons -ve and ions +ve, the metal has no overall charge and it is neutral. When a power source is connected to the wire and switched on, voltage is produced which provides a push to make the conduction electrons flow around the circuit. I will then set the voltage at a suitable start point by using the power pack to adjust the voltage but will look at the voltmeter across the pencil lead, as this is what I am measuring. I will probably use intervals of 0.1V and increase it at equal intervals using the variable resistor. It is much simpler to set up and it should give me similar values of resistance. When I tried setting up this circuit, I found I could do it with a lot more ease, and I need not spend as much time as I did with the Wheatstone Bridge arrangement.